Pencil Kitchen: Quiche Frenzy - Traditional Quiche Lorraine. Spinach & Brie, Potato crisp quiche. Chicken breast & mimolette quiche. Self-saucing Chocolate Rum cake quiche. Quiche Frenzy - Traditional Quiche Lorraine. Spinach & Brie, Potato crisp quiche. Chicken breast & mimolette quiche. Self-saucing Chocolate Rum cake quiche. The results for the rainbow cake was shocking. All of a sudden, friends and family no longer looked at me as the kid playing with play-doh. In layman's term, the rainbow cake was served to test and nobody's dead (except for Steve Jobs, may he rest in peace). So, this week I promised to bake something savory. I'm never good at this. After-all, the food I like to eat are limited to warm and cold salads, occasional chunk of steak, ocassional burger fetish, sandwiches, eggs, cheese, soups and traditional Indonesian dishes that uses at least 10 different spices that i hardly can translate to English. My friends often ask, how can I be a "chef" or "baker" if I don't eat. I'm not picky with food, i hardly hate any specific ingredients except eggplants and olives, I just do not have the stomach. I love cakes. I love them to death! However, I don't mind eating a bad cake (over and over), I'm easily impressed over simple presentation or just melted chocolate. I do have a few comments for cake stores who act all high-and-mighty but have bad cakes, yet, I do not have my set of passion to finding the best cake in town. Atmosphere. Atmosphere is utmost importance to me. Even if the cakes were meh-ok, even if drinks are a little overcharged. That traditional overly midget wooden coffee table, sofas that do not have matching colors, songs played in an acceptable volume and people who serves cheerily. I want that. I want to open that. That's how I got to this quiche. I used Julia's shortcust pastry and trust me, it is a little troublesome with the pre-bake, but the result is heavenly. This crust is one of the most scrumptious, crunchiest quiche base i have ever tasted. And, looking to feel less terrible eating a quiche? Use this recipe. 1. Sift together flour, salt, and sugar into a mixing bowl. Work Butter and shortening into the flour to resemble coarse meal. Sprinkle in up to 6 tbsp. ice water and knead into a dough. Dust Flour as needed to form a smooth dough. Shape into a flat disc, wrap round in plastic and refrigerate for 2 hours. 2. Preheat oven to 200 Celsius. Allow dough to soften slightly at room temperature before rolling out on a lightly floured surface. Fit dough, without stretching it, into a buttered ring. Press overhanging dough down slightly into sides of ring to make the sides of the crust a little thicker and sturdier. Run the rolling pin over the top of the ring to remove any overhanging dough. 3.Using a fork, prick bottom lightly. Line dough with baking paper, then add pie weights or dried beans. Bake until crust is set and edge just begins to color, about 25 minutes. Remove foil and weights, brush bottom and sides with egg, and continue baking until crust is pale golden, another 2-5 minutes. Note: As I knead, I knew, it would be good, you'd understand when you make one. At this point you might wonder why I have a few quiche varieties. I made one batter, prepared types of cheeses, a few meats, sliced potatoes and a bit of spinach. For the Quiche Lorraine, (the one with ham), I chose the traditional (SURPRISE SURPRISE) no-cheese filling. For Chicken breast, I opted using Mimolette Cheese, hence, the bright orange color. For Spinach, I used Brie and a crispy potato top crust. (This is also to balance the salt content of each combination). Now, the batter. Smitten Kitchen's batter recipe was indeed quite close to Julia Child's traditional recipe, except for its Sour Cream overload and that extra tanginess that drives away that heavy feeling in a quiche. And what will sour cream do, if not make anything taste a little better. 1. Mix the heavy cream and sour cream in a medium bowl. Whisk in the remaining three eggs. Add a pinch each nutmeg, salt and pepper and combine to form a batter. Voila. 1. Fill crust with toppings of your choice, pour batter till it fills up the crust. 2. Bake at 190 celsius for 30-40 minutes until top is golden. I feel like quiches are a good compromise between cooking and baking. I also feel like a quiche without brie is a tragic, tragic thing. Look at all these quiches! That chocolate one is screaming my name. Actually they all are. Yum! @ Greg: Thank you for visiting back! Quiche frenzy 'aye! These looks amazing...makes me want to bake some :) Thanks for stopping by my blog. Gorgeous! Love the pictures and your style! @ Denise: oh yes! your quiches look scrumptious! love the sound of the Self-saucing Chocolate Rum cake quiche! Yum! Chocolate quiche!? Yes please!! @ Alicia: i know! its almost like chocolate pie but not quite! Lovely looking quiches, I love quiche. The chocolate one is really clever. Well, my palate is geared towards savory foods like this and I could definitely make a piggy of myself with all these luscious quiches! Great idea, thanks for this fingerlicious chocolate pie. @ Handmade Kitchen: Thank you for dropping by! You have inspired me to make tarts tomorrow! Will have to check what's in my fridge. oh my god look at all these quiche! this must have been the best day. Oh! 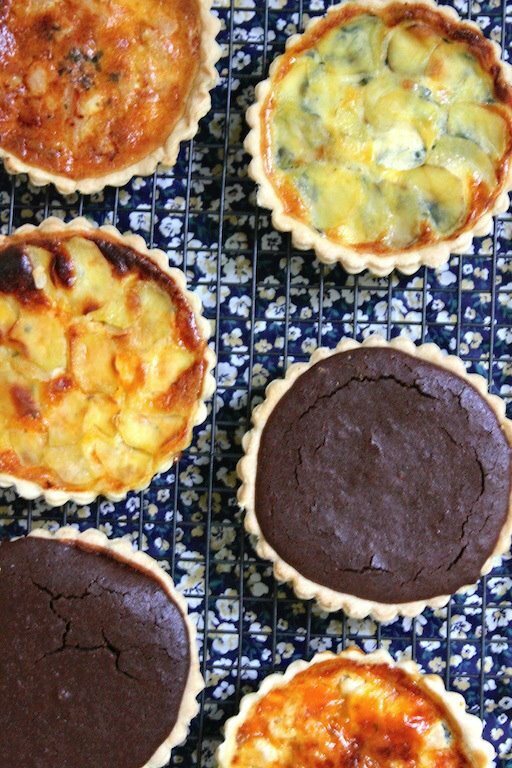 Wow, you sure did go all the way with the savory, minus that chocolate tart. :) I have a quiche lorraine on my to-make list that I'm planning to make shortly... this just motivated me to actually get moving and make it!